We’re all über-excited : Ian Svenonius is coming soon in town with his brill band Chain & the Gang. Emma is having wet dreams, Marie tries to loose weight, Amande is ready to “see the wolf” and Ruth is jumping everywhere. No wonder why : this chap is not even making the most exciting music after Stevie Wonder, but he’s also a hotty. You don’t believe us ? 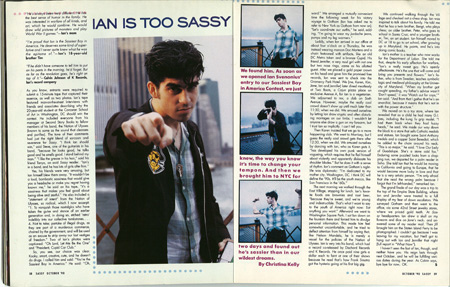 Jump in the Tippex time machine, get back to 1990 and read Sassy Magazine : Ian-our-only-love was, then, the “Mister Sassy / ideal boyfriend” of the year. The editors were pretty hyper about their choice: “a total babe vegetarian punk philosopher with greased-back hair a a sweet, crooked smile”. He won the contest, beating out 150 other entries for the title. You want to meet your new idol ? You’re lucky, he’s playing soon in your town ! Chain and the Gang meets Flashmama! Dramatic make-up and boogie genius : Bobby Conn is back !